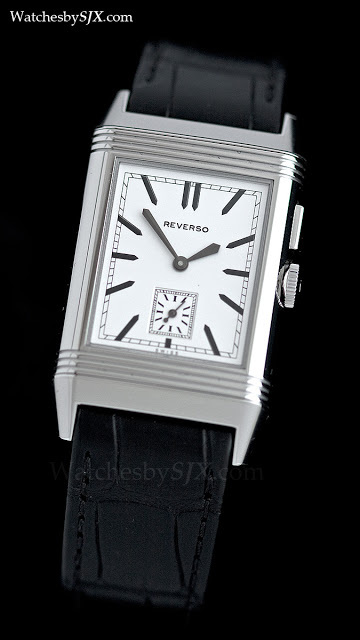 One of my favourite Reversos is the Duoface, a complication perfectly suited to the twin faces of the Reverso. 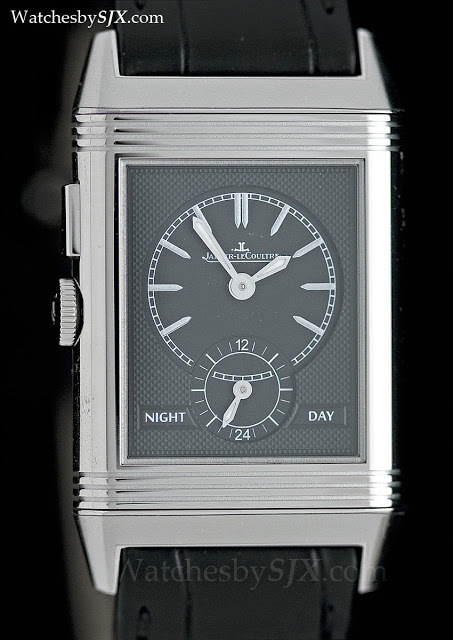 At SIHH 2013 Jaeger-LeCoultre unveiled the latest dual time zone Reverso. 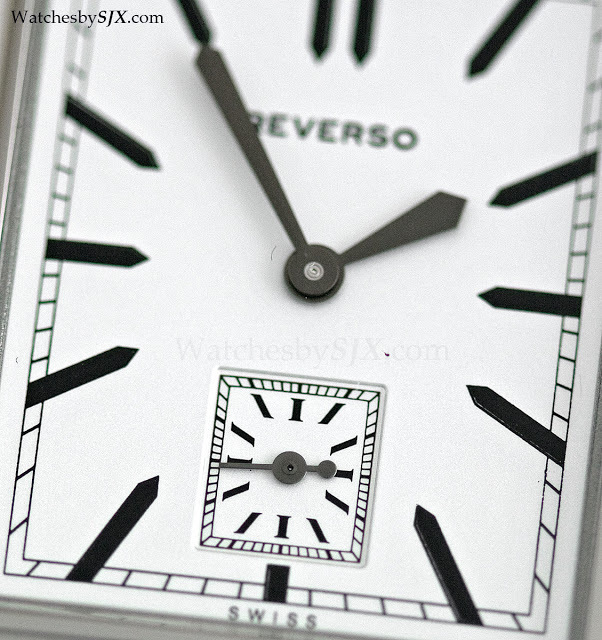 The complication most suited to the Reverso is the dual time zone, with one time zone displayed on each side. Doing exactly that is Grande Reverso Ultra Thin Duoface, the newest dual face Reverso in a series, starting with the Reverso Duo of the nineties; there is even Reverso Duetto for the ladies. 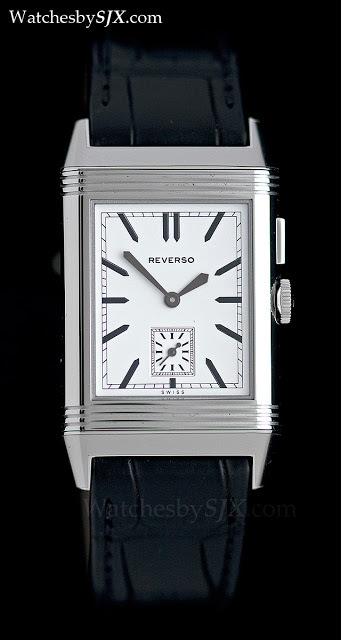 Like the previous Reverso Duo, the new Grande Reverso Ultra Thin Duoface is equipped with the manual wind cal. 854/1, which is essentially the cal. 822 fitted with a second time zone on the back. Despite being almost 20 years old, the cal. 854/1 is a brilliant piece of engineering, like most of the other JLC movements developed in the nineties, many of which are still in use today. The cal. 854/1 is compact and efficiently construction – it has just 21 jewels – yet functional, with a 45 hour power reserve. The Grande Reverso Ultra Thin Duoface works in a simple fashion: the front dial shows local time, while the reverse shows home time. Set forwards in one hour increments with the button at two o’clock, the home time dial is also equipped with a 24 hour indicator. If there is one criticism that can be made, it is the lack of a date indicator. 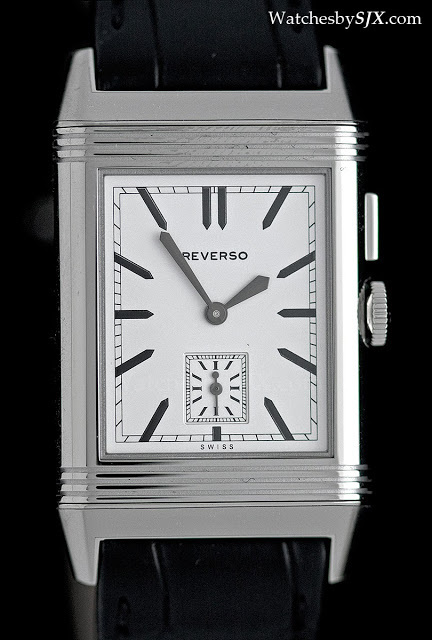 Like all other Reverso watches, the Duoface has grown to suit the times. The Grande Reverso Ultra Thin Duoface is the first dual time Reverso to use the extra-large and also extra-slim 1931 case. Measuring 46.8 mm by 27.4 mm, it is fairly large, but flat enough to fit under a cuff, an important consideration for most travellers. Amongst the watches launched at SIHH 2013, this stood out for me, along with the Master Calendar, as a well executed and accessibly priced timepiece. 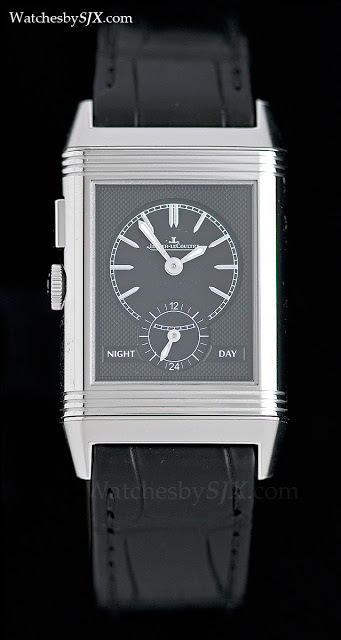 Pictured is the Grande Reverso Ultra Thin Duoface in steel, which retails for S$14,400 (~US$11,400), including 7% tax. Additionally, a limited production steel model with a blue dial is available only at JLC boutiques at the same price as the regular model. It is also available in rose gold for S$26,200 (~US$20,700).